Proxy marriage is a marriage where one or both the spouse is not in the same country. Many countries like Pakistan where the Pakistani Nationals gets very less opportunities to travel abroad and meet their beloved one in such a country the law of proxy marriage in Pakistan is a blessing. Proxy marriage in Pakistan is legally valid like many other countries. The proxy marriage process in Pakistan involves a lawyer in Pakistan. Without a lawyer many countries does not recognize proxy marriage. Many countries believe that the legal work should be done by a lawyer only. So the proxy marriage procedure in Pakistan is always conducted by a lawyer holding a valid license to practice law in Pakistan. Registration of marriage in Pakistan is a legal process which only a lawyer in Pakistan can do the best. The solicitor or a registrar is not recognized by many countries. Law of Proxy marriage varies from country to country as every country has their own law. Through proxy marriages in Pakistan many Pakistani nationals get an opportunity to get spouse visa and with that visa they get an opportunity to call their dependants in other countries. Moreover proxy marriage in Pakistan also save your money and time because for marriage you don’t have to come to Pakistan and spend a lot on money on air tickets and take leaves for your marriage. So in order to save your money and time you can avail the services of proxy marriage in Pakistan and our law firm is specialized in this field. Embassy work may also involve in Proxy marriage in Pakistan which a competent lawyer will guide you as per law of the Pakistan. On payment the lawyer will start the proxy marriage procedure and will guide you what exactly needs to be done on the part of spouse. In normal conditions the spouse just have to sign and put his thumb impression on the documents and the lawyer in Pakistan will do the rest. When an embassy work is involved, The lawyer hired by you will send you the docs and the spouse will have to visit their embassy and follow the instructions of your lawyer. Pakistani nationals can also do Proxy marriage for visa in Pakistan because the registered government certificates will entitle you to apply for a spouse visa based on these documents. 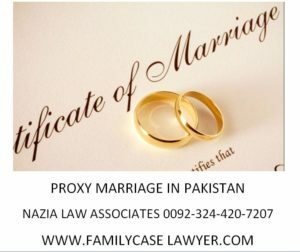 Advocate Nazia is the best proxy marriage lawyer in Pakistan who can be contacted from Pakistan and from abroad to conduct the proxy marriage procedure in Pakistan. Nazia law Associates is an experienced law firm for the proxy marriage services in Pakistan and have conducted thousands of proxy marriages in Pakistan. 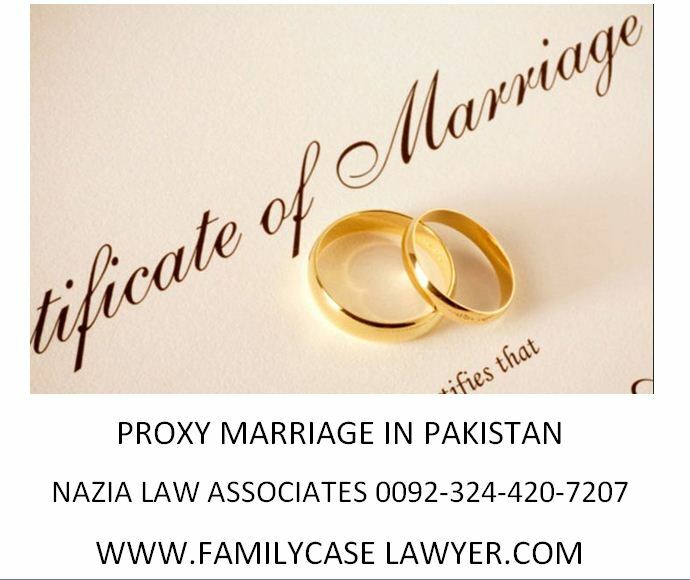 So if you have any question about proxy marriage or you wish to get a solution for your proxy marriage in Pakistan do not hesitate to call Advocate Nazia at 0092-324-420-7207 and if you are calling from abroad you can also WhatsApp our law firm on the same number which will be replied by the best lawyer Advocate Nazia herself.